Welcome to the McDonald’s Customer Satisfaction Survey on McDVoice.com. 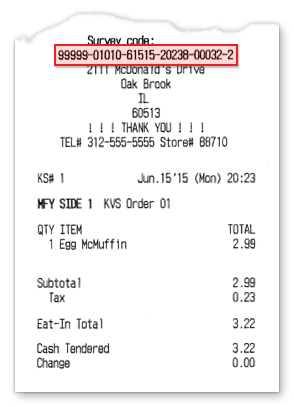 If you do not have a 26-digit code printed on your receipt, click here. All content herein © 2019 Service Management Group, Inc., except that McDonald’s owns all survey data collected herein. All rights reserved. McDonald’s customers may participate in up to five surveys per month per restaurant.